This Money Box with Handle is a classic design. 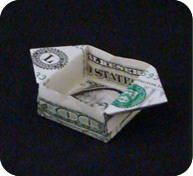 It can be made with a rectangle of different dimensions to give a handle of different sizes. 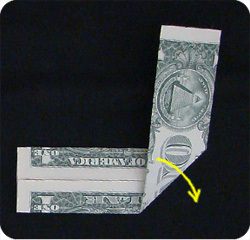 With a dollar bill, the handle can be large (left), folded in half to give a medium sized handle (middle), made into a triangle (right), rolled into a scroll, pleated, or it can be folded down completely so there is no handle. 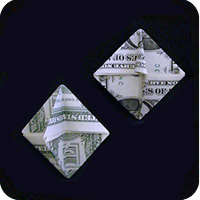 Start with a crisp dollar bill with the black-side facing up. 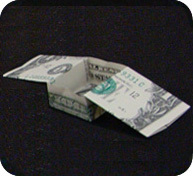 Fold the top-edge and bottom-edge of the dollar bill towards the center crease. 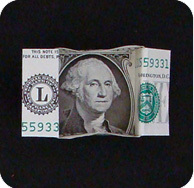 Fold up the right-side of the dollar bill so the bottom edge of the bill is aligned with the vertical crease (looks like a backwards “L”). Repeat with the left-side of the dollar bill. 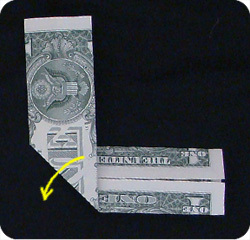 Fold up like a letter “L”. In the center you will see creases which look like a letter “X”. the new crease will be at the right-corners of the letter “X”. Repeat on left-side of the dollar bill. 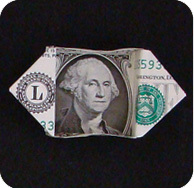 Fold dollar bill across using the left corners of the “X” as a guide. 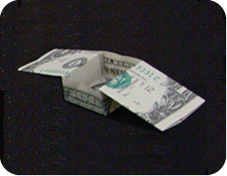 On the right-side of the model, peel open the two layers of paper and fold along the creases made in step 3 & 4. Allow the right-side of the model to swing to the left. Valley fold (fold forward) the top and bottom parts of the model so it doesn’t extend beyond the central portion of the model. 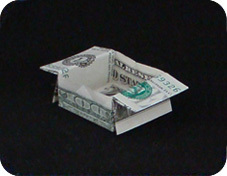 Fold the top flap of the model back towards the right side. Repeat step 7 on the left-side of the model. Peel layers open. 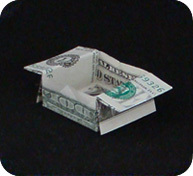 Repeat step 8: fold the top and bottom parts of the model towards the center. Repeat step 9: fold the top-layer back towards the left. Almost done: pull the left and right edges apart from one another. 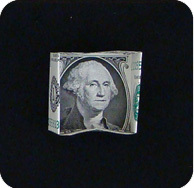 Money Box with Handle with the black-side (front) or the green-side (back) of the dollar bill facing up. 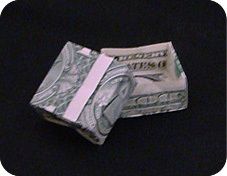 Handle is shortened by folding the large flap in half. Handle is folded so it looks like a triangle. Flaps are folded down completely so there is no handle. 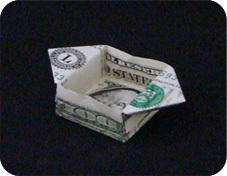 If you choose this design, you can fold two boxes and use one as a lid. The way to hide the handle is pretty cute: Fold the flaps back towards the bottom of the box. Insert one end into the other end, this locks the paper in place so it doesn’t unravel.